Theater in the Now: Review: That's the Ticket! 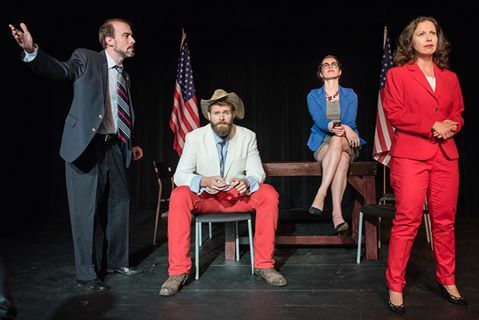 With comedy like "Veep", drama like "Scandal" and Sorkin-esque wisdom and sensibility, Dream Ticket by Ryan Bernsten is an aptly timed political play. Republican Senators Leslie Sugarman and Becky Roberts are battling it out for the nomination for President. After spewing insults and personal jabs, the pair decides to team up to create the ultimate dream ticket. The catch is the duo has an intimate history they must keep covered up. With political scandals running ramped, can the deceitful Republicans win the race? Bernsten's play is sharp. His writing his quick. His characters are rooted in stereotypes. It works for this piece. While poignancy was present, Bernten's platform was first and foremost to entertain the masses. And he did that. While it have relevancy outside this political climate? That's debatable. Taking on these large personas allowed this company to brave politics through humor. As the grounded Leslie Sugarmn, Chris Payseur had a demeanor like Toby Zeigler from "The West Wing." As his rival-slash-running mate Becky Roberts, Amy Lee Pearsall made a Southern monster that you loved to hate. Similarly, Olivia Jampol's Darla finger was brash and outlandish. If ever there was done ripe for a spinoff, it's Jampol and Darla Finger. Taking a stab in his own play, Bernsten was adorably bro-tactic. Bernsten’s Ty Chadwick had no credibility, capturing the millennial spirit. Kristin Skye Hoffman smoothly staged the production, allowing the momentum to rarely falter. With all the moving parts on wheels, Hoffman's transitions were fast. The costumes from Laurel Livezey were perfectly rooted in Americana. Solid reds and blues tend to be the go-to for politicians so having Leslie in a patterned tie that strayed from screaming politician was a bit problematic. Dream Ticket is a gentle reminder that if enough people believe the conviction, you may have to settle for the lies you asked for. Let's hope the Dream Ticket mirror doesn't reflect this November.